Update: you can now buy the Leeds Tube map as a poster for your wall! Hello visitors! See this update for v3 of the map! My Leeds Tube map was an unexpected hit on Twitter, and I even ended up being in the Yorkshire Evening Post! I also received some feedback from people who would like to see my fantasy tube support more of the population centres in Leeds. Some of the feedback was very constructive so I’ve taken the time to update it with two new lines, the East Circle, connecting settlements in East Leeds, and the West Line that connects Armley and Bramley with the rail network. Click to view a larger version on Flickr. I also updated the Google Map to show the real1 locations of these stations. As before, this is released under an attribution-noncommercial licence, so feel free to print it out or use it yourself for things as long as you credit me and don’t make any money from it. And the SVG source is available too. If you have any comments on the update, leave them below or on Twitter! Love this plan, there are still a few things I would love you to add though, Wondered what you think…. Secondly, I would extend the abbey line to Ilkley. 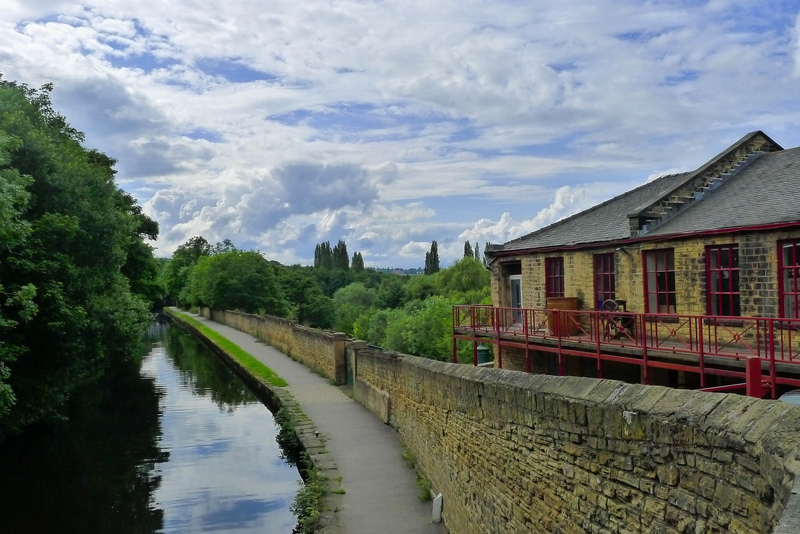 I know they have fantastic metro trains already but what about the people that want to travel from Otley to Ilkley ect… Ilkley has an LS postcode, so lets bring that money into the city centre. Finally, it would be quite chaotic on the Skyrack line if there were Leeds Rhinos and LUFC homegames on during the term time (or on a weekday). It may be an idea to add further lines to the stations that could encourage congestion (Perhaps take the west line down to, and the allerton line up to Leeds United. 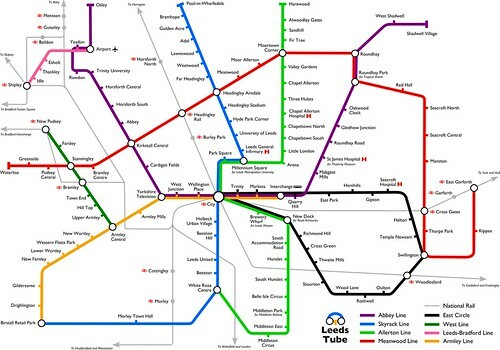 I would also add a ‘northern line’ that runs from New Pudsey>abbey>Headingley Rail>Stadium> Three Hullets>Roundhay Park). It may also be an idea to connect Leeds Arena to more lines to reduce congestion too? And just to point out (so you can further perfect your great work) there are a few stations that need Circles as more than one line crosses them. You might be right about the Skyrack Line. I’ve had a few thoughts about how I would do that in a real situation, and the “Northern Line” was what I was trying to achieve with the Allerton Line, although there are obviously alternatives. The Leeds-Bradford Line was added specifically to create a link with both mainline stations in Bradford and Leeds, as they both have extremely frequent and fast trains to Shipley (this isn’t the case with Leeds-Horsforth, as there are stops in between and the trains are only twice an hour). The circles are only on “recommended interchanges”. This correlates with how the London Tube Map (on which this is based) works. See the Circle and District Lines, for example. Thanks again for your suggestions. If I ever work on this again I’ll find a way to incorporate some of them! Very nice, but I have a suggestion. There are large parts with no station or connection, so I suggest a Tram line, á la Duisburg or Essen in Germany. They could go underground in the city center and on the streets in the areas with no LeedsTube service. This tram service could also run to Ilkley, to get those commuter pounds rolling in. You could take the U79 or the U76 of Düsseldorf as an example. And just a teensy idea: Why not make an advert for these? The slogan could be “Keeping Leeds Moving” But still great map. It’s important to extend the Leeds-Bradford Line to “Horsforth North” to serve passengers on the Harrogate line. I understand that the other mainline links provide more frequent services to-and-from the city but, for people coming towards Leeds, it would be much better to have a direct link from Horsforth than to have to take a longer route changing at Headingley and also Kirkstall. Love the map dude its awesome. Living in Leeds it certainly puts a smile on my face. One question the London Underground map does all its angles at 45 degrees. Would it be possible to do a 2.0 version like this? Most transport maps copied this system I believe. Keep up the awesome work dude its amazing! 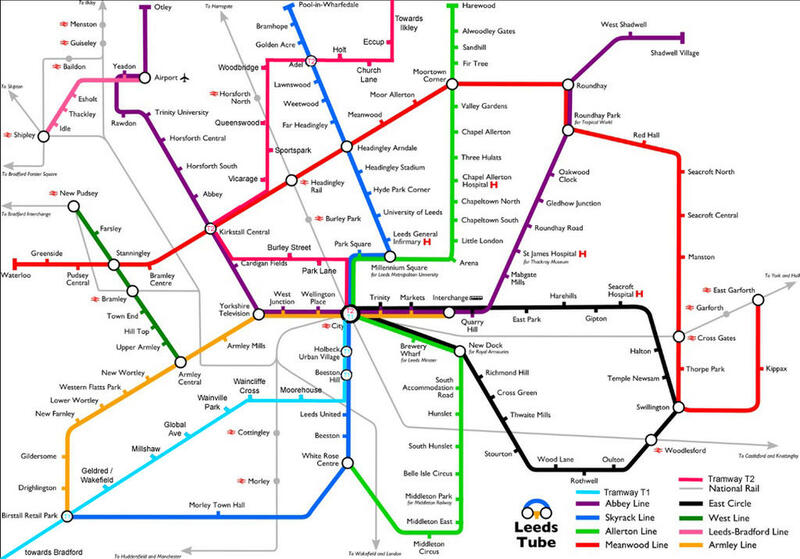 Unfortunately it’s not possible to do this one with 45-degree angles and keep the National Rail lines on there too. I do have plans for something bigger in the future, though! This map is wonderful. Any plans on printing it up and making available to purchase? It would make the most ideal present for my other half! You’re welcome to print it yourself. The SVG source scales to any size and there’s a version at print resolution available from the download menu on the Flickr page. Just please talk to me first if you or anyone is planning to make any money off it! I promise not to attempt to make any money from it. I will be hanging it from a wall in my home! Thank you again, it really is fabulous. Have you seen the latest version of Moovit on the iPhone? It includes this map amongst it’s public transport maps for the Yorkshire area! I know this is old but it still upsets me that baildon doesn’t have a tube station, it’s train station is bad enough please help it out. Aw – I was trying to cover the areas that don’t have train stations. That’s how the London Underground works, in general. But a decent transport plan in my utopia would include improving the train station, providing more frequent trains, and integrating the ticketing with the Tube.